90 Saint Marks Avenue, Apt 3. 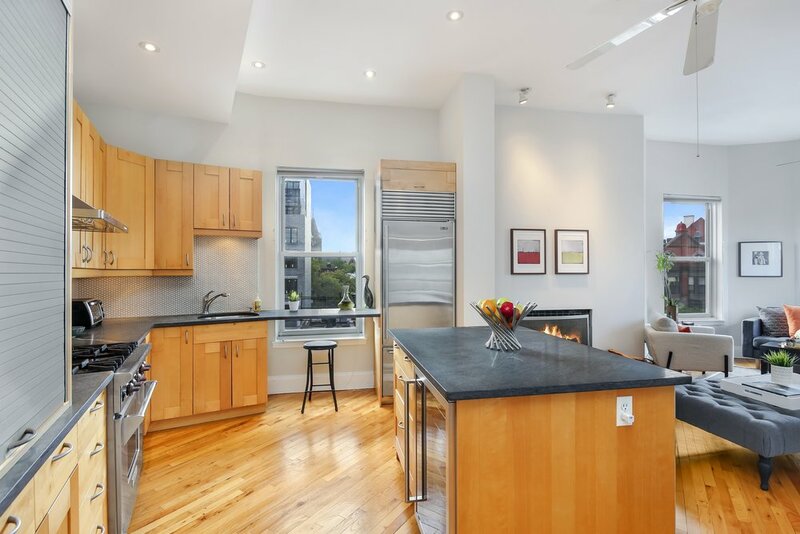 Located on a lovely, tree-lined, brownstone block on the Park Slope/Prospect Heights border, this sprawling 1500 square foot apartment offers three REAL bedrooms and two baths and has an airy, loft-like feel. The large open floor plan boasts three exposures which bring in exceptional light no matter the time of day. The expansive renovated kitchen has plenty of work and storage space and features honed granite counters, a penny tile backsplash, and stainless steel appliances including a Wolf range, Bosch dishwasher, Sub Zero fridge and an under-counter wine fridge. The spacious living room has a working wood-burning fireplace and a beautiful bay with three large windows. All three bedrooms are generously-proportioned (two easily fit king size beds!) and are well-situated away from the main living area. The master bedroom boasts a windowed, renovated en-suite bath. The main bath, also renovated, has a double sink and a sizable linen closet. The apartment has a vented washer/dryer in the unit, soaring ceilings, and hardwood floors throughout. The unique floor plan is open and spacious and the light is simply amazing! Best of all, one flight up and most easily accessed from this unit is the large common ROOF DECK which offers striking skyline views of downtown Brooklyn and Manhattan.